SS. 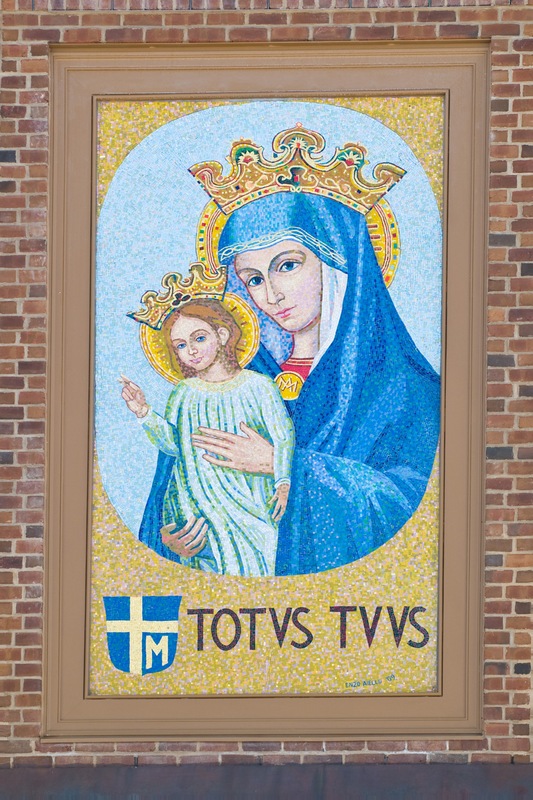 John and Paul Parish in Franklin Park/Marshall Township, nearing completion of construction on its church building, this month installed a large-format mosaic of the Blessed Mother on the exterior of its bell tower. Italian mosaic artist Enzo Aiello arrived to personally adhere his “Mater Ecclesiae” (“Mother of the Church”) creation to the structure. The artwork, measuring 5 feet 9 inches by 10 feet 6 inches, faces the parish’s main driveway and will be one of the first images visitors see. The story of the parish’s new mosaic, according to Father McCaffrey, pastor, is an example of “how Divine Providence worked into this, with how flawlessly it has worked out. “We have the feeling that the hand of God is on this,” he said. In 1981, after the attempt on his life, Pope John Paul II commissioned a mosaic reproduction of it for the outside wall of the Apostolic Palace in thanksgiving to the Blessed Mother, whom he credited for his survival. It carries the pope’s motto, “Toto Tuus,” at the bottom. Father McCaffrey led a pilgrimage of parishioners to Rome to attend the ceremonies elevating the parish’s founding pastor, Archbishop Daniel DiNardo, to the rank of cardinal. Standing in line to enter St. Peter’s, Father McCaffrey noticed the mosaic, hanging between the basilica and the papal residence. He was impressed by its beauty and soon learned its history. “I said to Bob and Chris Pietrandrea, who were on the trip with us, ‘It would be nice if we could get a replica and place it on the church as a beautiful connection with Pope John Paul II and the universal church,’” Father McCaffrey recalled. Soon, the match was made. Father McCaffrey and the couple returned several months later to visit Aiello’s studio and view his drawing of the proposed mosaic and make the commission official. The blue-and-gold image of Mary and the Child Jesus created for SS. John and Paul is a much larger version of the original, as interpreted by Aiello. He worked on the project for four months, creating it in sections. He then installed the replica by section. Aiello is pleased with the result. Aiello has worked as a mosaic specialist for 20 years, beginning as an apprentice in the Vatican Studio of Mosaic in Vatican City, which dates back to 1727. Today he lives and works in Rome, where he also restores antique mosaics and teaches. His works are on view at sites in New York and other parts of the country. As the scaffolding was being removed, Aiello was putting finishing touches on the brickwork framing the work and cleaning the mosaic before attending its unveiling on Sunday, Sept. 20. The parish is hoping to dedicate its completed church on the feast of Our Lady of Guadalupe, Dec. 12, pending completion of construction work. That work involves masonry both inside and outside of the structure, followed by paving of access sidewalks.